Electric Wheelbarrows and Scaffolding, Ready for any Concrete Job Site! The Overland Cart has been tested in the cement industry and come out a winner. Mix concrete right in the hopper or pour it in from a truck, both are simple tasks with the Overland. Four wheels provide more stability and control, so no more tipping, no more messes. Our C-Series carts offer best in class Brentwood hi-density polyethylene hoppers for maximum durability and strength. 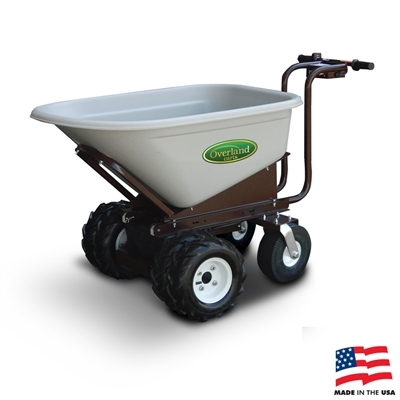 Fill it up with whatever you’ve got: cement, gravel, stone, dirt, – Overland Carts can handle it! The Snappy SP-6 scaffold system is the premier utility scaffold on the market. Engineered and manufactured with quality in mind, this scaffold system impresses in all areas. The Snappy SP-6 line of scaffolding features an industry exclusive “Snappy” operation. A spring loaded G-pin allows for quick yet safe adjustments. This leads to quicker and safer height adjustments. Available in 6′, 8′ and 10′ lengths. Heights range from 27 inches to 6 feet. Add on a guardrail, or double the height with the Double Snappy. The Power Snappy is an industry first! 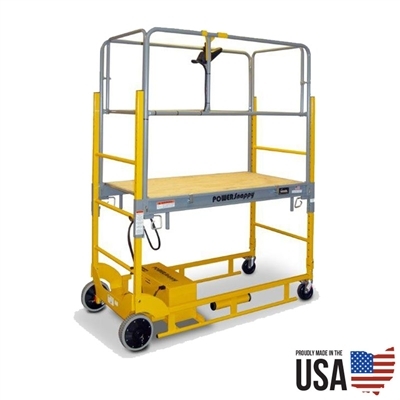 Using an all electric drivetrain, this scaffold tower is free to move at the flick of a wrist. The Power Snappy is now in it’s second generation of development. 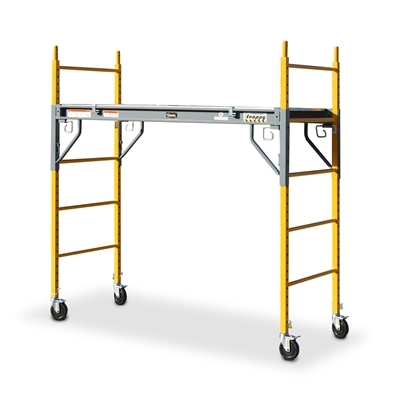 Never content to sit back, the Electric Power Snappy has continually improved and is a robust work platform capable of saving significant labor hours. See video below. The roof protection system from Granite is designed to make work environments safer. OSHA is emphasizing safer working conditions for employees. This fencing lowers the risk of a serious accident on the job site while promoting safe practices. The roof protection fencing comes in three different lengths; 4′, 6′ and 8′. The feet are nailed to the roof to provide stability to the fence section. Granite adjustable work planks provide the ultimate in versatility. Available in the lengths: 6’-9’, 8-13’, 10’-16’, there is always the perfect length for the job. Constructed from aircraft grade aluminum, these walk boards are lightweight, strong, and durable. Stretch from ladder to ladder or scaffold to scaffold. Capable of handling 1,000 pounds each, they are safer and built better than the competitors. The slip resistant surface keeps people and products where they should be. Made in the USA.